The SLR has had a fine run and Mercedes is extremely proud of the media and car enthusiast’s attention towards their SLR vehicles. These sports cars are some of the best that have ever been built and they have definitely pushed Mercedes Benz back to their drawing boards to reengineer and create incredible achievements. So, to commemorate the final run of their SLR exotic sports cars, Mercedes has found a way to really put the cherry on top of the sundae- the Mercedes Benz/McLaren SLR Stirling Moss. These incredibly beautiful vehicles will unfortunately only be offered in Europe and a total of only 75 vehicles will be produced. The body of this SLR is incredibly beautiful with wonderful swooping lines, no windows and no roof. However, what you do get is plenty of power, performance and a definite wow factor. The car is named after race car driver Stirling Moss who won a wide variety of races using the 300 SLR in 1955. Under the hood you will find a supercharged V8. This V8 is incredibly strong and offers 650 hp. What this power translates to the road is sheer acceleration. 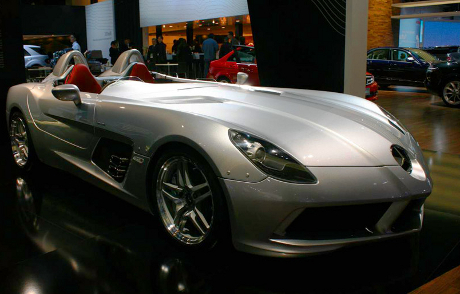 For instance, the SLR Stirling Moss can accelerate from 0 to 60 in less than 3.5 seconds. This is faster than most exotics and in the range of cheetah territory. Since this vehicle will only be available in Europe, drivers will surely enjoy the autobahn and this vehicle’s whopping 217 mph top speed. Again, it should be emphasized that this vehicle will be made in very small numbers- 75 total and Mercedes has made it known that only their most loyal customers will even be considered. However, for those wondering the price tag of this beauty- its one million plus.